For the second time in my (very long) life, I seem to have had an ocular migraine. I had one some years back – but the symptoms were a bit different; but close enough that I feel okay with my self-diagnosis. I was checking out at the grocery store, and suddenly had bright flashing spots obscuring part of my vision, which quickly passed. Then I had a small circle in the center of my vision that was very clear, and the rest of my vision was fuzzy. The circle of clear vision got bigger, bit by bit and the edges developing a jagged appearance. It wasn’t until I got home that it got a little scary. My vision totally dimmed – like I was looking through a dark fog, and I felt like I might pass out. So I sat down and closed my eyes, and the dimness got a bit lighter. When I felt safe, I went and laid down for 20-30 minutes, and it was over. 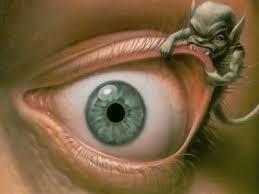 Ocular migraines can come with or without the headache, and it seems I have lucked out with the no-headache version. And Mayo Clinic assures me the symptoms are generally temporary and not serious. Kind of trippy and a little scary but happily not painful. June 23, 2016 in Health, Its All About Me. THIS FAT OLD LADY WANTS TO KNOW – WHO’S BEEN HOLDING OUT ON HER?